You’re not launching food and starting a food fight. Nor are we advocating making food that will skyrocket the most-likely already energetic nature of your little one. This week we’re focused on arugula, which is also called rocket – no joke! Names of leafy greens don’t get more kid friendly than rocket. Given the recent heat wave, we’re using this leaf green in a simple pasta dish. Adding a bit of rocket to the menu means an extra burst of vitamin C and potassium. Plus, who wants to be in a hot kitchen for longer than necessary? You’ll need to bring a large pot of salted water to boil then cook 8 ounces of penne pasta. You can substitute whole wheat for a healthier alternative. While it’s cooking, crumble 5 ½ ounces of goat cheese into a large serving bowl. Add 2 cups of coarsely chopped arugula. It’s OK to use the stems. Arugula has a rich, peppery taste that isn’t as strong when mixed with olive oil. You’ll also want to add 1 cup of quartered cherry tomatoes, ¼ cup olive oil, 2 teaspoons of minced garlic, and a ½ teaspoon of each salt and pepper to the bowl. Lastly, drain the pasta and toss it in the mixture. You have a nice, delicious, quick and family friendly dish to serve for dinner. It could also be a nice pasta salad for tomorrow’s lunch. That little leafy plant giving a spot of green and a hint of peppery to the pasta traveled a far ways before ending up in your dinner bowl. Arugula has been grown in the Mediterranean area since Roman times and is often considered an aphrodisiac – although those properties are believed to have diminished over time. Now arugula’s added for the flavor and vitamin elements. Arugula was collected in the wild until the 1990s when large-scale cultivation began. Today it’s grown in many places, specifically Veneto, Italy, but is available worldwide. Cultures use the spicy veggie in different ways. Many people simply add it to salads or use it instead of lettuce. 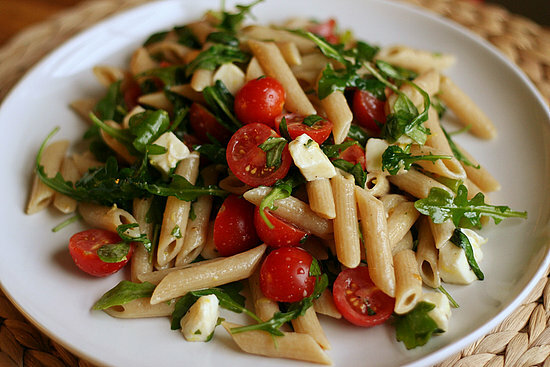 Northern Italy uses arugula in pasta while those in Slovenia add it to cheese. There’s one island that creates an alcohol that aides in digestion from the plant. Arugula is part of a breakfast menu in Egypt, where they also pair it with seafood.